I love big cats and Chester zoo has a large collection of these animals. The Jaguar complex is unique in the UK. These animals are rarely seen despite the fact that they live in different types of habitat. 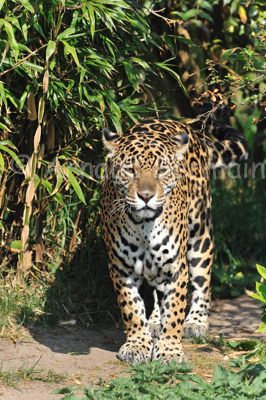 The Jaguar complex replicates these different habitats and it is usually difficult to see the cats in their enclosures as they are so well designed. On the day I took the picture, the jaguars were very active (even trying to hunt a duck that had landed in a pond in their enclosure). I took the shot as it looked natural and as if it had been taken in the wild.